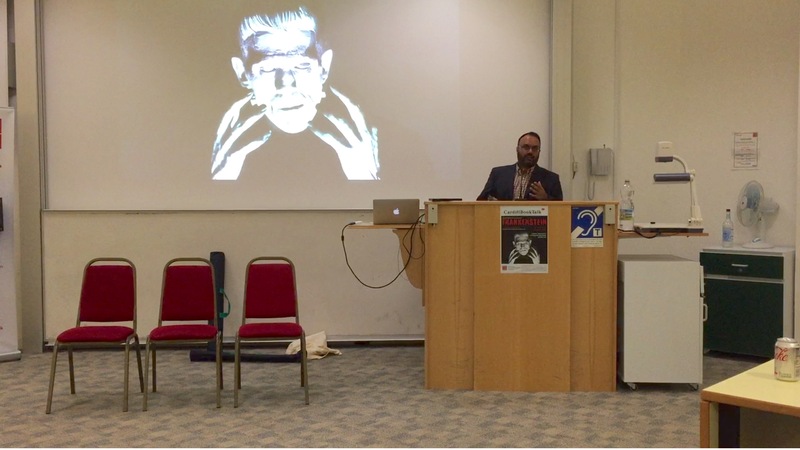 A report by Caleb Sivyer on the sixth BookTalk of the 2015/16 season, which took place on 30 June 2016: Frankenstein (1931), dir. James Whale. 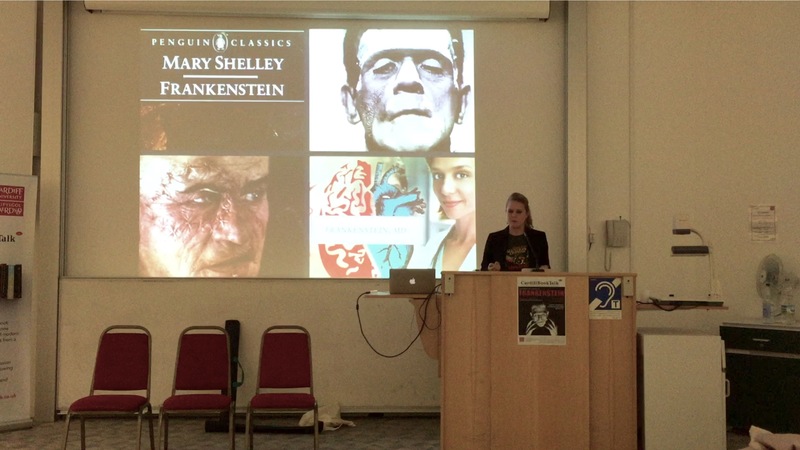 Switching things up for our sixth event of the season and marking the 200th anniversary of Mary Shelley’s composition of Frankenstein (1818), BookTalk held a film screening of Universal Pictures’ iconic 1931 adaptation of Frankenstein, directed by James Whale and starring Boris Karloff as the monster. In the usual fashion, we heard from three guest speakers followed by our ever-lively Q&A session. 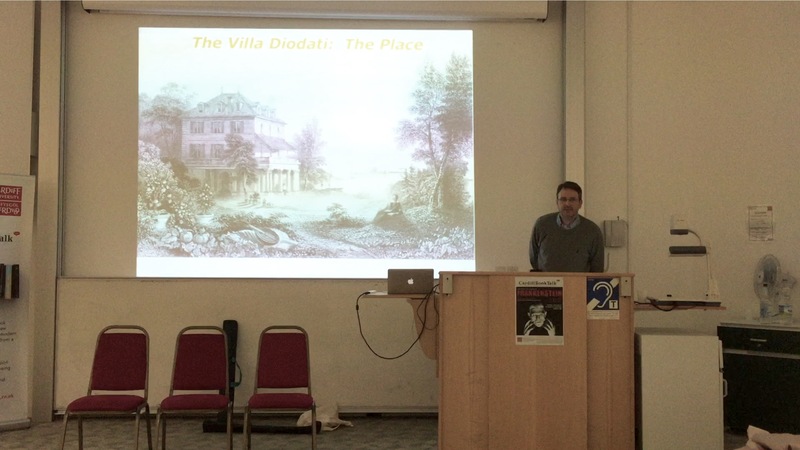 The event was co-hosted with the Cardiff Romanticism and Eighteenth-Century Seminar (CRECS), which is also run by Cardiff University. Introducing the film was BookTalk’s Professor Anthony Mandal from the School of English, Communication and Philosophy at Cardiff University. Anthony kicked things off by reminding the audience that BookTalk’s first event was on Mary Shelley’s Frankenstein, and so the film screening of James Whale’s cinematic adaptation of the novel brings Cardiff BookTalk full-circle. Anthony also spoke briefly about the inspiration for Shelley’s tale: one fateful night in Geneva in 1816, Lord Byron, John Polidori, Mary and Percy Shelley decided to have a competition to see who could write the best ghost story. What began initially as a short story or tale, eventually became a full-fledged novel. Anthony then illustrated a similarity between Shelley and Victor Frankenstein by reading out two passages, one from the novel itself, in which Frankenstein’s monster comes to life for the first time, and the other from Shelley’s 1831 introduction to the novel, in which she herself speaks of the monstrous creation of her text. In this way, the trope of the hubristic (and often mad) scientist and the figure of the author come together. Moving on to the film itself, Anthony next gave some background information about both the movie and Universal Pictures. Frankenstein (1931) was part of a series of successful horror pictures produced by Universal that also included Dracula (1931) and The Mummy (1932). Frankenstein was both a commercial and critical success, and Boris Karloff’s performance as the monster has since transcended both the book and the film, firmly implanting itself in the collective consciousness. The figures of the mad scientist and faithful assistant have also lived on, appearing in countless tales of dangerous creations and megalomaniacs. Anthony also discussed the strange sense of temporality of the film: the modern laboratory with its electrical equipment and bubbling test-tubes is oddly contrasted with the town’s old architecture and the traditional costumes worn by its inhabitants. If the mad scientist’s laboratory has come to stand in the popular imagination as a modern Gothic space, the film also includes a variety of older Gothic spaces such as the graveyard and gallows, from which Victor steals body parts for his abominable creation. This mixture of old and new fits well with the story’s central preoccupation with hybridity. Anthony concluded his introduction by speaking of the enormous popularity of the film, which no doubt was partly responsible for the huge number and variety of sequels and spin-offs. Bride of Frankenstein appeared just a few years later and not only gave a companion to the monster, but saw the latter gain a voice too, humanising Frankenstein’s creature. This was followed by Son of Frankenstein in 1939 and featured Bela Lugosi (famous for his role as Dracula) as the faithful assistant Igor. Other films included Ghost of Frankenstein (1942), Frankenstein Meets the Wolf Man (1943) and even the horror-comedy Abbott and Costello Meet Frankenstein (1948). All of these, and many more, testify to the enormous and continuing influence that Frankenstein has had on popular culture. Maximiliaan explored the ways in which the Romantic period was marked by a rich interchange of moving texts across Europe. 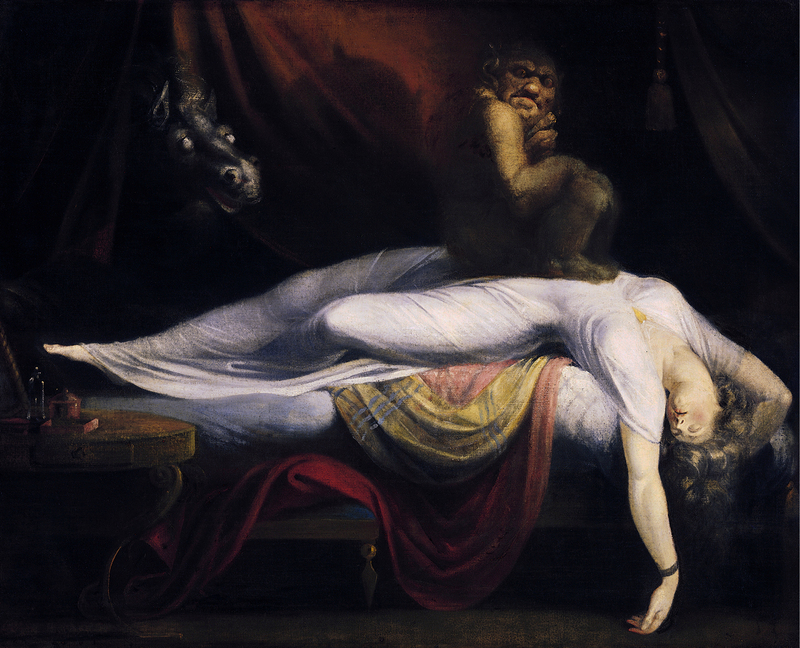 Frankenstein belongs to this rich tradition of continental intertextuality: in many ways a number of the paradigmatic tropes of terror and horror that we find in SHelen’s novel can be traced back to the Germanic gothic conventions of Gespensterbuch–Fantasmagoriana. Maximiliaan concluded by looking briefly at one of the stories ‘The Grey Room’, which anticipates a number of the set pieces of Frankenstein (the creation scene and Elizabeth’s death). Next, we heard from Dr Lisa Stead (University of Exeter), who filled in some of the context for the film production itself. Lisa reminded the audience that the movie was produced during the Great Depression of the 1930s and therefore a number of the film’s scenes would have resonated with audiences of that time in a variety of ways: the mob versus the monster, the restoration of the status quo at the movie’s finale, a sense of relief about a threatening change in society, and the image of easy solutions to difficult and frightening problems. The film could thus be thought of as a barometer of the societal temperature. Given the economic downturn, movies needed to entice audiences to part with their money and no doubt the thrills offered by films like Frankenstein were a success in this respect. It is also likely that the gloomy mood of this period had an affect on the tone and style of many films, such as Frankenstein. Developing this theme, Lisa noted the enormous influence of German Expressionism, in films such as Robert Wiene’s The Cabinet of Dr Caligari (1920), for Frankenstein mimics the angular set designs and dreamlike imagery of this cinematic mode. Lisa also pointed out that this was not the first time that Frankenstein was adapted for the cinema. The first attempt was made in 1910, a 16-minute silent version produced by Edison Studios that was thought to have been lost forever, until a copy surfaced in the 1970s. The film was then restored and released into the public domain in 2010. 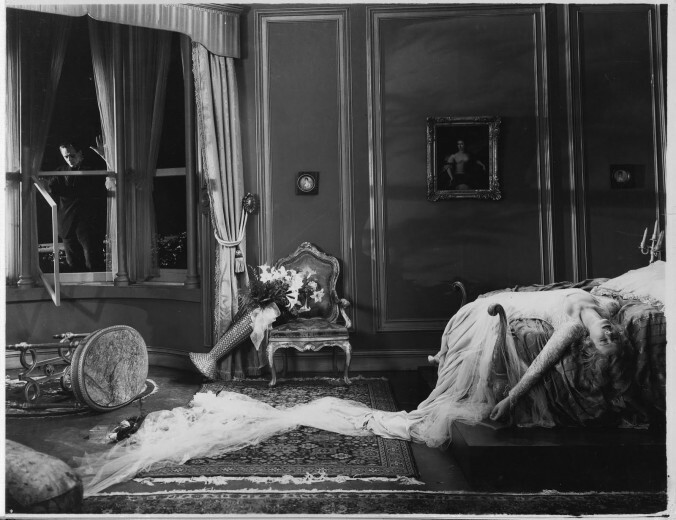 As Lisa observed, film versions of Frankenstein often stray heavily from Shelley’s text, and the 1931 version is no exception. The framing devices and the scenes in the arctic are both dropped and even the message itself have been completely changed. Instead, what takes centre stage are the spectacular thrills of creating of man and then watching the ensuing chaos unfold. Lisa concluded by discussing the importance of censorship: the Motion Picture Production Code, often referred to as the Hays Code, was in force from 1930 and a number of scenes from the film were cut and only appeared in the late 1990s when the film was re-released. The scene in which the monster first comes alive originally featured a line in which Victor exclaims, ‘Now I know what it feels like to be God!’, a line that was cut for reasons of blasphemy. Thirdly, Megen outlined the ways in which Frankenstein has been travestied, through cartoons like Mary Shelley’s Frankenhole (2010) that feature irreverent representations of Frankenstein’s monster meeting historical figures such as Adolf Hitler. In concluding her presentation, Megen emphasized the importance of adaptation and rewriting for the afterlives of texts. She quoted with approval literary theorist Chris Baldick’s claims that all texts behave monstrously towards their creators and she ended with almost a mantra: keep rewriting it, keep changing it. 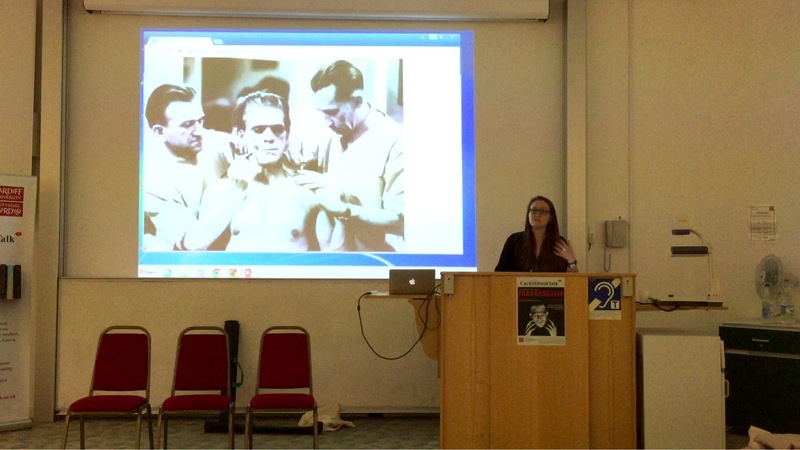 A version of Megen’s talk can be accessed on her blog Angels and Apes: Monsters, Mashups and Popular Culture. The final part of the night was devoted to our regular and lively Q&A. Audience members asked a number of interesting questions, and on a range of topics including: how and why stories cross boundaries, both literary and geographical; the role of censorship and when this came to an end; differences between the original text and its cinematic adaptation in 1931; the theme of solitude; and the issue of gender in Frankenstein. There was a lively discussion and all of our guests enjoyed talking both with each other and with our audience.